The family is going skiing and snowboarding but you don’t ski or snowboard. So now what? How about taking to the slopes with them? There is a fun winter sport or activity that just about anyone can enjoy. It is called Snow Tubing. Snow tubing is sometime called simply “tubing”. To feature your business, contact us. Please share your NH comments. Snow tubing brings back those childhood memories of sledding down Grandma’s backyard hill. When your wooden and metal Speedaway sled was not available we would visit the barn to retrieve a big truck tire tube. The tube functioned well as a sled, though controlling speed and direction was nearly impossible. Today, snow tubing is different. The tubes available at most ski areas and winter resorts now have steering and braking capabilities. Snow tubing is now safer and easier than ever. If you can sit, stand, and walk you can snow tube down a hillside and enjoy the winter snow. As the baby boomers age and their bodies begin to feel the effects of the process, snow tubing is becoming more attractive as a winter fun sport. In fact, snow tubing is now one of America’s fastest growing winter activities. Loon Mountain, Purity Springs Resort, Bretton Woods and other New Hampshire Ski Resorts offer excellent snow tubing opportunities. What exactly is Snow Tubing? Similar to sledding, snow tubing involves sliding down the hill while sitting on a large vinyl tube. At the base of the hill the snow tube rider can take the chair lift or rope tow back up the hill and repeat the process. If you enjoy the snow, and sledding, you will love snow tubing. Why is Snow Tubing a good choice for the entire family? Snow tubing requires little or no skill. Expensive and time-consuming lessons are not required. Specialized equipment is not required. Special clothing and gear is not required. Snow tubing is relatively inexpensive. Where can I go Snow Tubing In New Hampshire? 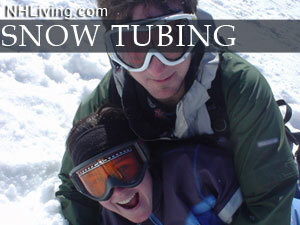 There is snow tubing available at many New Hampshire Ski Resorts. Explore Loon Mountain, Bretton Woods Resort, Steele Hill Resort, and Purity Springs Resort or find the complete listing of New Hampshire Ski Areas or NH Inns for more information. What Should I Wear When I Go Snow Tubing? Temperatures and weather condition of course will vary. Dress in layers, and dress warmer that you think, you can always take off a layer of clothing but neglecting to wear enough clothing can ruin your day. You should dress for snow conditions and utilizewaterproof clothing. Some clothing suggestions are; long underwear, insulated jeans, waterproof snow pants, gloves or mittens, a hat, helmet or headband, waterproof jacket and ski / snow pants. Goggles are recommended or required at some tubing locations. The bright sun can be blinding without quality sunglasses and also provide eye protection. At most Snow Tubing areas participants are required to wear snow boots, hiking boots or waterproof shoes. Ski boots are usually prohibited for safety reasons. What is the best time to go Snow Tubing? This winter fun activity is growing in popularity. Call in advance to confirm information, check the weather forecast or weather maps, and make a reservation. We have had several local ski resorts report that the Snow Tubing sessions are selling out, sometimes days in advance. Call ahead and save the hassle. Find the telephone numbers and contact information to ski areas in our NH Ski Areas section.